As a result of the migratory crisis, the transformation of Frontex into a European Border and Coast Guard (EBCG) became a political priority for both the EU and the Member States (MS). Regulation 2016/1624 aims to strengthen the position and independence of the EBCG from the MS, which have not always fully cooperated with Frontex. Frontex was established in 2004 to coordinate and provide operational assistance to the MS in the management of their external borders. The powers initially delegated to Frontex to enhance a uniform and effective implementation of EU border management gradually expanded with the adoption of Regulations 863/2007 and 1168/2011. Regulation 863/2007 introduced the rapid intervention teams and a Central Record of Available Technical Equipment (CRATE). While this equipment was intended to be used on a bilateral basis between MS, it provided a limited inventory of equipment that could also be used in joint operations. 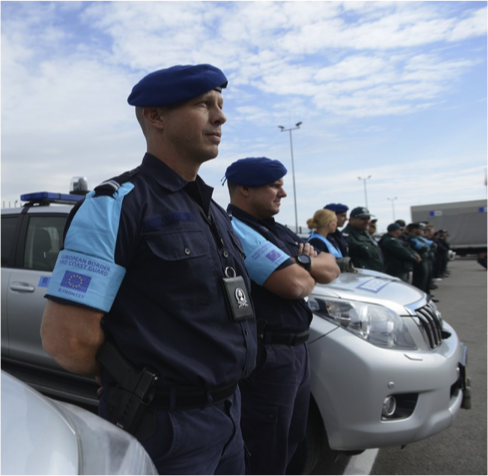 Regulation 1168/2011 reinforced the operational capacity of Frontex and its autonomy. Article 7 ordered that “the Agency may acquire (…) technical equipment for external border control to be deployed during joint operations, pilot projects, rapid interventions, joint return operations or technical assistance project (…)”. Moreover, Regulation 1168/2011 created the European Border Guard Teams. Particularly, article 3b(3) established that Frontex “shall also contribute to the European Border Guard Teams with competent border guards seconded by the Member State as national experts”. For a period of up to six months, Frontex was competent to decide where and for how long the seconded guest officers were going to be deployed (see, Commitments of MS to the European Border Guard Teams and the Technical Equipment Pool). Despite these developments towards a more independent and effective support to the MS when implementing EU border management rules and policies, the Commission argued that Regulation 2016/1624 would provide the EBCG “the additional competences needed for it to effectively implement integrated border management at Union level (…)”. The Commission stressed that notwithstanding the fact that the EU designed a policy enabling MS to build and maintain sound external borders, the discrepancies in implementation at the national level still remained. However, while the European Commissioner Dimitris Avramopoulos referred to the new agency as “a fully-fledged European Border and Coast Guard system”, Regulation 2016/1624 has not created an agency with exclusive powers in the management and surveillance of the European borders. Rather, it expands the supervisory and operational functions originally delegated to Frontex, which may enhance a uniform and efficient implementation of EU laws and policies. First, article 3(2) of Regulation 2016/1624 grants the EBCG a supervisory role to ensure a common integrated management of the EU’s external borders. If certain weaknesses were identified at the national external borders, the executive director of the EBCG shall recommend the adoption of specific measures by the concerned MS. Supposing these measures were not implemented in an effective or timely matter, the management board of the agency would adopt a binding decision setting out the necessary measures that the MS must implement (article 13(8)). Secondly, Regulation 2016/1624 delegates the EBCG greater technical and operational competences (article 18(2)). In order to effectively assist the MS, the EBCG may acquire its own technical equipment (article 38) and it will have at least 1,500 border guards at its disposal to be immediately deployed in joint operations or rapid border interventions (article 20(5)). This new possibility delegated to the EBCG to acquire its own equipment may pose legal and fundamental rights challenges, for instance if the EBCG decides to conduct border surveillance using its own aerostats (blimps), un­manned drones or optionally-piloted aircrafts. The most contentious competence is what has been referred as the EBCG’s intervention capacity. The new agency is empowered to monitor the effective functioning of the external borders of the MS, carry out vulnerability assessments, verify whether a MS is able to effectively enforce EU law and detect deficiencies in the management of its borders. If a MS either fails to take the measures recommended in its vulnerability assessment or does not request or fails to take the necessary action in the face of disproportionate migratory pressure, the EBCG shall adopt a unified and effective EU approach, since the functioning of the Schengen area might otherwise be jeopardized. How will this new intervention power delegated to the EBCG work in practice? Article 19(1) of the Regulation 2016/1624 states that “the Council (…) may adopt (…) a decision (…) identifying measures to mitigate those risks to be implemented by the Agency and requiring the Member State concerned to cooperate with the Agency in the implementation of those measures (…)”. Subsequently, the director of the EBCG must, after reaching an agreement with the MS concerned, “determine the actions to be taken for the practical execution of the measures identified in that decision (…)” (article 19(4)). That is, the MS must consent and agree to the operational plan before the EBCG implements it. If the MS neither implements the decision taken by the Council, nor agrees with the director of the EBCG on an operational plan within 30 days, the European Commission may authorize the other MS to reestablish border controls at the Schengen area (article 19(10)). Hence, it is debatable to what extent the new agency will be capable of imposing the execution of certain measures to a MS that completely resists such measures. In this case, the only feasible solution seems to be the exclusion of the non-complying MS from the Schengen area. Therefore, the implementation powers delegated to the EBCG are still very limited since border management is a distinctive competence related to state-centered matters such as sovereignty, fundamental rights or trade. The EBCG constitutes another necessary and timid step towards an effective and uniform implementation of an integrated management system for external borders. The deliberately ambiguous text of the Regulation 2016/1624 aims to find a balance between the increasing need for an effective and uniform European strategy at the external borders and the resistance of the MS to further delegate sensitive competences closely linked to their national sovereignty. Yet, the emerging shared implementation powers between the EBCG and the MS may lead to important accountability and fundamental rights issues that must be assessed as they arise. This entry was posted in Current Affairs and tagged centralization, enforcement, EU JHA Agencies, European Border Coast Guard, Frontex, Regulation 2016/1624. Bookmark the permalink.